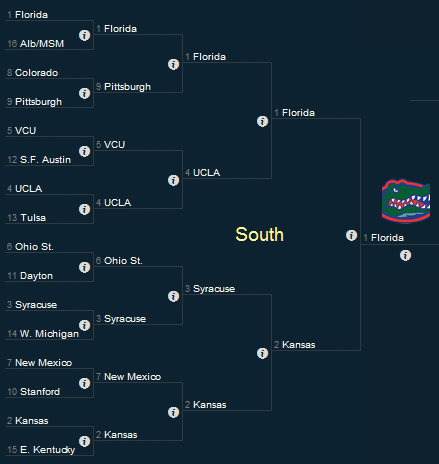 The #1 overall seed Florida Gators highlight the South Region. Currently riding a 26 game win streak, they have not lost since December 2nd against UCONN, and their only other loss was the 2nd game of the season against Wisconsin. The Kansas Jayhawks drew the 2 seed in the South. Syracuse and UCLA were seeded 3 and 4 respectively. Florida has been to consistent all year round to bet against them now. I am a big fan of Bill Self and the Kansas Jayhawks and I have placed them in the Elite 8 with the Gators. Syracuse has been struggling as of late, but will give Kansas a run in the Sweet 16. 9 Pittsburgh over 8 Colorado is my only upset in the region.